Barrier islands cover much of the east coast of the USA, from the Mexican border all the way to Canada - these low-lying strips of land, formed by deposition of sand and pebbles by sea currents serve to protect the main coastline from weather and high tides. 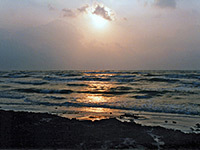 Padre Island lies off the southern Gulf Coast of Texas and is geographically just about in the Southwest although it is a long way from the deserts and canyons of Arizona. Only the northern tip of Padre Island is inhabited; beyond lies the longest stretch of undeveloped beach in the US with over 80 miles of empty white sand coastline. beyond is quite empty and often inaccessible due to shifting sand and occasional submerging of narrow sections. The north is the main island; this is the area protected as a National Seashore and it is more easily reached - the first 10 miles by a paved road or a hard pressed track on the beach, the remainder by 4WD vehicle only. The road starts off as I-358 through Corpus Christi, becomes P22 across the John F Kennedy Causeway onto the island, through North Padre Island village - a few miles of typical beachfront town with holiday homes, hotels and sea-related businesses, then past several miles of empty dunes across the NPS boundary, finally ending directly on the beach a few miles later (see map). Along the main road is a large visitor center complex, with a developed campground, a 0.7 mile nature trail and a nearby boat launch ramp (on the west side of the island). South Padre Island (not part of the national seashore) is rather different in character. It is shorter and narrower, but the far southern end is a bustling center for recreation and leisure, with many hotels and bars, famous amongst other reasons for being a major spring break destination. Padre Island National Seashore is relatively free of rules. Once inside (and after paying the entrance fee of $10 per vehicle per week), camping on the beach is free. Wood gathering and campfires are allowed, as are collecting of shells and other beach debris, and fishing - either in the sea or the lagoon on the west side (with a Texas state license). 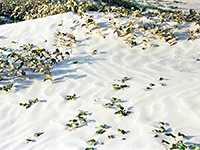 Only activities in the dunes and grasslands are restricted, to protect the wildlife that lives there and prevent erosion. 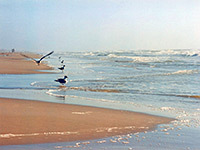 Padre Island has particularly varied bird life. 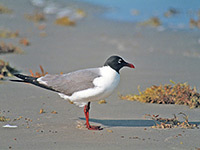 Most common are laughing gulls, sandpipers, geese and herons but over 300 other species are recorded. Diamondback rattlesnakes, coyotes, deer and rabbits live in the dunes, while ghost crabs inhabit the area just above the high tide mark, and are responsible for the many small holes in the dry sand that mysteriously stay unblocked, even when sand is blown about by the strong sea breezes that affect the island during most summer afternoons. The endangered sea turtle may also occasionally be spotted, and during the egg-laying season park rangers patrol the beaches looking for any signs of activity. Most people visit the beach on day trips, for typical activities of sunbathing, swimming, windsurfing and fishing. The weather is warm all year and onshore breezes moderate temperatures in summer - usual highs then are around 90°F compared with often over 100 inland, and also tend to keep clouds away - see weather and climate summary. Sea temperatures in summer are in the 80s and the water is clean; the only hazards are the stinging Portuguese men-o-war jellyfish that are sometimes encountered. The beach shelves quite gently and so is good for paddling though the waves can become quite high in windy conditions. At some times of year the currents cause much seaweed to be washed ashore which spoils conditions somewhat. Starting from the end of the paved road, mileposts at 5 mile intervals indicate the distance south. Only about 5 miles are reachable by 2WD vehicles - the sand is too soft beyond. The other 55 miles are little different, just emptier, with the only variation being the extent of the grasslands in the centre of the island - sometimes the sand and dunes at the edge continue right across to the west side. This is said to be the largest undeveloped section of barrier island anywhere in the world. Sea shells are generally not found in great quantities on Padre island except for two quite extensive areas centred around miles 12 and 24. The only other notable feature is near mile 50 - the wreck of the Nicaragua which ran aground in 1912. The only full service hotel on North Padre Island is the 5-storey Holiday Inn Corpus Christi, which has a beautiful beachfront setting about ten miles north of the entrance to the national seashore. The well reviewed hotel is located in a quiet area, with undeveloped coastline at either side, though less than 2 miles from various shops and restaurants in North Padre Island. 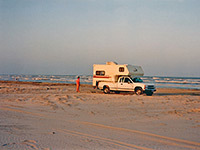 More North Padre Island hotels. Other nearby towns with hotels: Ingleside, Kingsville, Port Aransas, Robstown and South Padre Island.